I’m delighted to have a friend popping by today. Ashley Lister is a brilliant poet and novelist- and now he is stretching his literary prowess into the realm of horror. Back in May I was lucky enough to attend a writing workshop hosted by the wonderful Jenny Kane. I don’t mention this just to brag or name-drop, although those are two of the main reasons. I mention this because, it wasn’t until I came to write this blog post, that I realized I had already incorporated some of her brilliant workshop ideas into my writing. I’ll rewind a little. My name is Ashley Lister. I’m a creative writing lecturer and I write in a variety of genres. 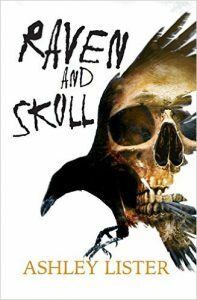 My most recent title, which was published yesterday, is a horror novel: Raven and Skull. It’s a cheeky story, scary in some parts and funny in others. I hope the book will scare and amuse in equal measures. And what does this have to do with Jenny Kane’s writing workshop? Well, the wonderful Ms Kane was suggesting an innovative approach to writing. She was suggesting that music could be a useful aid for any writer because it can evoke mood. Music could be useful because lyrics can inspire ideas. Music could be useful because rhythm is a great tool for helping with pacing. I was of the opinion that this wouldn’t work for me because I’m one of those grumpy writers who love to work in silence. If someone tries talking to me, or walks past ‘too loudly’, I throw a dramatic writer’s tantrum and claim that this ‘deafening cacophony’ is going to give me writer’s block. Consequently, the idea of writing whilst music was playing seemed like anathema to my usual process. This is Danse Macabre by the wonderful Camille Saint-Saëns. Listening to it, the piece does suggest spooky goings-on. There’s some great xylophone playing there, evocative of skeletons in graveyards. There’s a lot of quickening repetition, almost as though we’re listening to dramatic tension building. And there’s a delightful dance theme beneath the whole piece that always makes me think of smiling demons. Most importantly of all, it’s a fun piece of entertainment because it doesn’t seem to take its horror too seriously. Which is what I’d been hoping to achieve when I wrote Raven and Skull. I recently reread the book prior to publication and there is a mention of Danse Macabre in one of the opening chapters. It was whilst I was reading this, and revisiting the music at the same time, that I was struck by how much the spirit of the music is reflected in the story I’ve created. All of which is my way of saying, if you ever find yourself considering Jenny Kane’s wisdom, but wondering if it really does apply to you, rest assured that the lady knows what she’s talking about. I’m seriously blushing here! Thanks Ash- I’m glad my workshop helped a little- albeit without you realising it!